Jay AdamsA thorough guide to all aspects of practical theology exceptpreaching. Adams aims to be exegetically and theologicallysound as he examines pastoral life, counselling andleadership. Reprinting - available March 1994. 531 pages,from Zondervan. 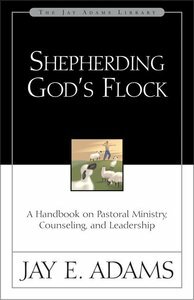 Shepherding God's Flock is both a textbook for students of pastoral ministry and a handbook for pastors. Jay Adams is well-known for his practical and thorough approach to the many issues of Christian counseling. That same practicality and thoroughness is found in this unparalleled handbook on pastoral ministry. Not only does it offer pastors one of the best resources in print, but it also provides church elders with an orientation and practical guide to aspects of ministry for which they have responsibility. It is truly a shepherd's handbook. The book is divided into three parts. Pastoral Life deals with the pastor, his calling, and the general care he provides the flock. Pastoral Counseling provides an overview of the task and a general approach for pastoral counselors. Pastoral Leadership offers a perspective on the ways the pastor can lead the church in its many tasks and responsibilities. Jay E. Adams (PhD) is a frequent lecturer at ministerial conferences both here and abroad. He has taught in England, France, Holland, Germany, Austria, Switzerland, Spain, N. Ireland, South Africa, Canada, Brazil, Guatemala, New Zealand, Austria, North Korea, and China. He has published over 75 books and is the translator of "The Christian Counselor's New Testament". He recently completed the ten volume "Christian Counselor's Commentary Series". He and his wife Betty Jane have four children.